I know it’s a bold statement, but there is nothing better than the Thirties Basie band with Lester, Buck, and the All-American Rhythm Section. So I was eager to buy the new Mosaic set and have derived an anticipatory thrill from the four discs still in their shrinkwrap, knowing what I will be able to listen to when I can’t put off the waiting one moment more. When was Lester ever a public servant? The mind reels. I do not share Mr. Friedwald’s muted distress at a possible overabundance of Lester’s music at the expense of those records featuring other players, and direct him back in time to a ten-record vinyl box set put out by French CBS, collecting every recording they could find of Basie’s recordings for Columbia, Vocalion, and OKeh in the 1936-42 period. (Mosaic has come up with new alternates, incidentally.) On paper, that CBS set looks like the Holy Grail, and Mr. Friedwald would be able to hear all five takes of “One, Two, Three, O’Lairy,” or whatever it was called. I find alternate takes thrilling for what they reveal of the creative process, but long stretches of this Basie set were surprisingly monotonous. But completists believe that what they do not have is much more important than what they do, and in some emotive way they might be right. 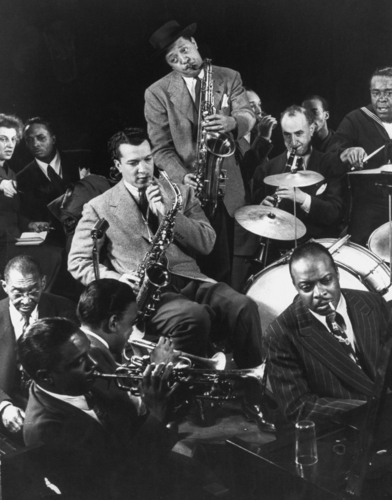 However, I must thank Mr. Friedwald for using the Sun’s resources to reprint a Gjon Mili photograph of Lester and Basie at a jam session. I believe this comes from Lester’s 1943-44 stint with Basie, because the drummer (probably Kansas Fields) is in uniform. The other saxophonist is altoist Earle Warren, and (for the moment) the trumpeters elude me. Is this another shot from the session where they were Dizzy Gillespie and Harry Edison? But I direct you to the clarinetist. It’s not Larry Talbot — it’s Milton “Mezz” Mezzrow, Jazz’s very own Zelig. And I am certain that Mezz is blithely playing along while Lester is taking his solo. If you insist on being charitable, let us say that he is joining the riffing behind Lester. Notice how he has wedged himself into the gathering, though, and the man behind him — Jo Jones! — has to crane his neck around Mezz to see what is happening. Gjon Mili took a number of wonderful shots of Jazz-in-action for a wartime feature published in either LOOK or LIFE around 1943, so this may come from that sequence. If his odd-sounding name is familiar in the context of jazz and Lester Young, he is also responsible for the short film JAMMIN’ THE BLUES. Bless him, and the players, too. I will have more to say about the Lester Young Mosaic once I have begun to break into my precious hoard.